HVS continually tracks the rates of return on the assets that we consult on. In our most recent review, we found that equity yield rates, on average, have been declining, due in part to the expectation of slowing EBITDA Less Replacement Reserve growth. The sample size of available data is also a contributing factor. Equity yield rates were notably lower for full-service and luxury hotels, averaging 16.8% for the year-to-date 2018 period (below the 17.7% level recorded for 2017), driven largely by a lower number of total transactions of this asset type, coupled with an increase in full-service sales of iconic assets in highly sought-after coastal markets with high barriers to entry. Equity yield rates for select-service and upscale, limited-service hotels averaged 18.8% for the year-to-date period ending September 2018, while the average equity rate for lower-tier limited-service hotels was 20.1% for the noted 2018 period. We note that the comparatively greater risk of supply growth within these asset classes contributes to investors’ need for higher hurdle rates on equity investments. Total property yields (overall discount rate) similarly declined for full-service and luxury hotels, while holding steady in the other categories. Total property yields are averaging 10.0% thus far in 2018 for the full-service and luxury category. 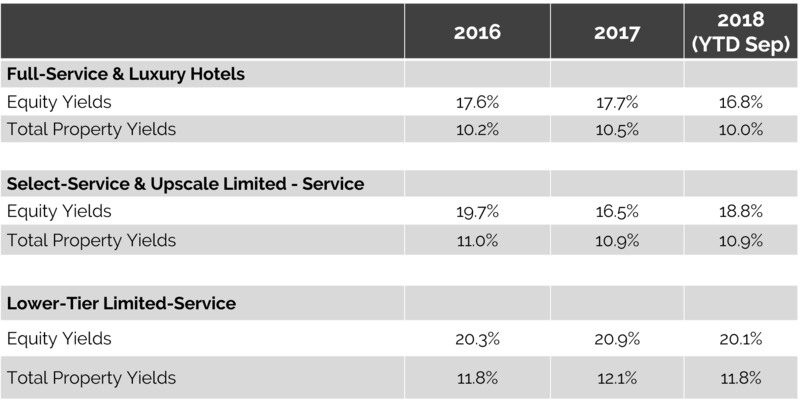 Higher levels of 10.9% for select-service and upscale limited-service hotels, and 11.8% for lower-tier limited-service hotels were recorded. This relationship to equity yields also reflects expectations of increased debt costs for hospitality investments. Rates of return are calculated using the actual sale prices of the hotels with forecasted cashflows, and inputting market terms for fixed-rate financing on a ten-year hold. HVS Managing Director Carter Allen oversees all hotel consulting and valuation assignments for the firm’s Houston office. Carter graduated from the University of Houston’s Conrad N. Hilton College of Hotel and Restaurant Management with an emphasis in Hospitality Finance and Development. He also served as President of the school’s student chapter of Hospitality Finance and Technology Professionals. Carter’s hands-on hospitality experience spans front-line work at The Houstonian hotel and operations and management internships with JW Marriott and CenterPointe Hotels. Contact Carter at (615) 982-3539 or callen@hvs.com. Rod Clough, MAI, is the Senior Managing Director of the HVS Denver office; Rod is also a partner in the HVS Atlanta, Dallas, Houston, Minneapolis, Philadelphia, St. Louis, and Mexico City offices. This group of offices represents over 60 hotel industry professionals and executes over 2,000 assignments a year. Rod has been working in the hospitality industry for 20 years and is a graduate of Cornell's School of Hotel Administration. He is a Designated Member of the Appraisal Institute (MAI) and a state-certified general appraiser. Contact Rod at (303) 443-3933 or rclough@hvs.com.